Doctors are a rare breed of investor. After years and perhaps a decade or more of study, they create for themselves a practice and a career built out of the care of others. On the way, they initially may build a significant debt of education loans, eventually pay them off, and then make a good and profitable living in their occupational pursuit. When retirement comes around, doctors consider their choices with their entire background in mind. As a result, they are likely to have different options and opinions about retirement than do investors from other occupations. These differences are the driving force behind Spectrem’s Professional Series, a set of studies specifically targeting investors from occupations such as doctors, lawyers and accountants. For years, Spectrem has compared Professionals to Educators and Managers and Senior Corporate Executives, and now it is looking specifically at the different types of Professionals. Doctors are usually able to afford their retirement. The years of extra study pay off financially after a period of time, and physicians usually end up with a sizable portfolio of investable assets. 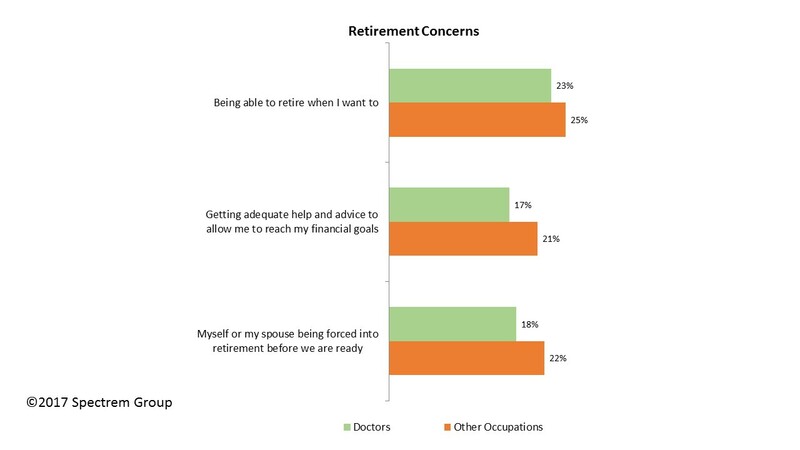 As a result, doctors are not quite as apprehensive about retirement as investors from other occupations might be. For instance, only 23 percent of doctors worry about being able to retire when they want to, and only 18 percent worry about being forced into retirement early through the loss of employment. In both cases, those percentages are lower than investors from other occupations. It is worth noting that these concerns are greater for doctors with less wealth. An example is the question about concern over whether the investor or the investor’s spouse might lose their job. Among Millionaire doctors with a net worth between $1 million and $5 million, 22 percent express that concern. Among those with a net worth above $5 million, only 15 percent are worried about job security. It must also be noted that female doctors are not as secure as male doctors when it comes to retirement considerations. Fifty-four percent of female doctors worry about being able to retire when they want to, compared to just 18 percent of male doctors. For advisors working with female physicians, there may be a need to reassure the client of the stability and viability of her retirement plans. Doctors express less concern over depleting their retirement funds too early, which is a growing problem in America thanks to increased longevity of its citizenry. People are living longer, and retirement funds are sometimes not ample enough to last as long as the investors are living. But doctors placed their concern on that issue at 22.2 on a 100-point scale, well below the concern level of other investors. Perhaps because doctors have a lower degree of concern over paying for their retirement, they have a higher degree of interest in passing their wealth onto others. A very high 64 percent of physicians say they have estate succession guidelines in their financial plan, well above the 42 percent of other investors. Estate planning and charitable giving guidelines are the two areas where doctors exceed other investors in their financial plan details. In dealing with physicians as investor clients, advisors need to examine several components while discussing retirement. Net worth and gender are obvious necessary factors, but a conversation about how they paid for their education and the debt they may have acquired along the way could help understand how investors save and invest for retirement. Another factor to consider when talking to clients who are physicians is determining when they plan to retire. Doctors can stay active in their profession well past the normal retirement age; they build a patient base that often depends on them and retiring from that profession is probably a difficult decision to make. But advisors need to know what the investor is thinking about the timing of retirement to best design a retirement income package for that client.